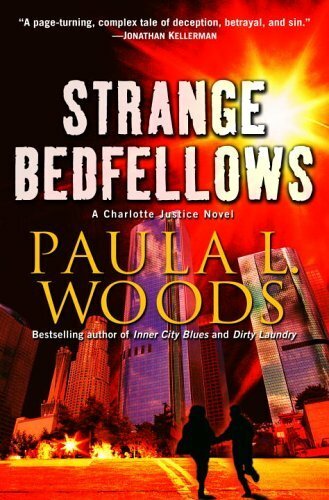 If you're looking for a good book featuring a strong lead female, exploration of race, class, and gender, and set against the fast-paced lives of people in Los Angeles, then look no further than the newest novel by Paula L. Woods, Strange Bedfellows. 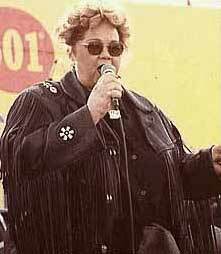 I've met Paula Woods on several occasions at book events in L.A., and heard her the other night on KPFKs Feminist Magazine radio show. Fascinating interview, as we hear the latest on Charlotte Justice, the lead protagonist of the novel, who's a black woman working as a cop for the LAPD. In addition to dealing with the stressful life as a woman and black police officer, Charlotte Justice manages tenuous relationships with a class and skin-tone conscious mother, a "princely" brother who keeps a myriad of secrets from the family, and a romantic partner who wants to help Charlotte deal with life on the force. The Charlotte Justice character has appeared in all the Paula L. Woods mysteries, including Stormy Weather, Inner City Blues, and Dirty Laundry. All the books look at the interesting dynamics of police work, racism, sexism, and other issues facing residents of large cities like Los Angeles. And I highly recommend for your own reading as well. More great reading coming up for the spring and summer months. Make Him Look Good by Alisa Valdes-Rodriguez. If you haven't had a chance to read her other novels, or her blog, you should. Great reading -- fun, brilliant, and informative.I always come away looking at the world and issues in a different way. Or should I say her work backs up a lot of what I'm thinking but can't quite put into words? Either way, great work. 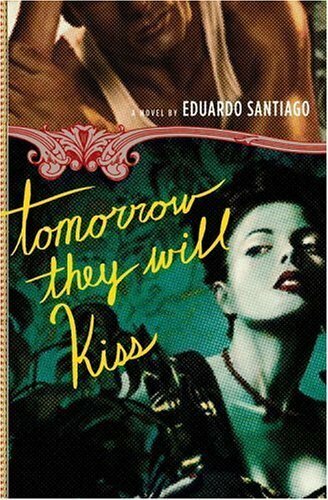 Tomorrow They Will Kiss by Eduardo Santiago. Eduardo is a friend of mine here in L.A., and he was a PEN Emerging Voices Fellow. He doesn't have a website yet, but here's a link to a short story he published for an online journal: Eduardo's This Magic Moment. Across A Hundred Mountains by Reyna Grande. Another friend in L.A., another PEN Fellow, and a great storyteller whose novel is quite timely with all the discussion about immigration. Reyna's personal story is moving. Check out her website. Found this cool article on the diversity of books written by and about black people. It's a good article, especially since so much attention has been given paid to people's concerns about "street lit," and the number of young folks reading that genre. 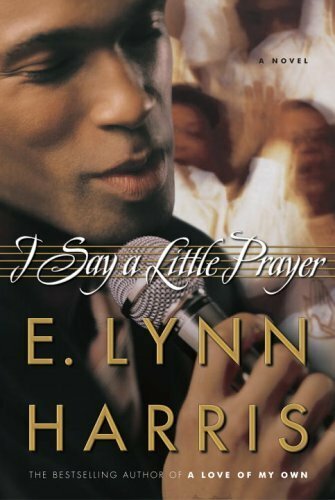 Street lit may make some bestseller lists, but they're not the only type of black books out there. Good (and short) article putting things into perspective. Oh yeah, and I did finish Octavia Butler's novel, Kindred. So glad I finally read it. And Eric Jerome Dickey is back with Chasing Destiny. How does he do it... every year something new and exciting being released!?!? Should be an exciting spring season for books from some of our favorites. Some of my local writer friends have spring releases coming, which I'll preview in a few days. What else is up on your spring reading list? I'm wishing for new furniture. I'm in love with this sofa/sectional. 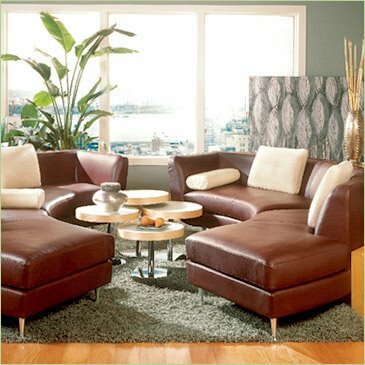 It's the Menlo Park, designed by Rick Lee, for American Leather. My sister and I spent a few hours together furniture shopping. Mainly for her. But now, I'm wanting to do a little for myself too. Part of my New Year's plan was to pay more attention to home and environment, so why not? But... this Menlo Park that I saw at a cute store in Detroit/Royal Oak called Bright Ideas , and a store in Indianapolis called Houseworks, comes primarily in leather. There's also the new "ultra suede" and "microfiber" materials that are popular now in furniture. I can see myself liking new leather -- it's soooooooo soft and smooth, not the 70s, 80s, 90s leather of our parents' or straight outta college generation that's hard and crunchy and dated. I saw it in a soft green called gingko, and the off-white and chocolate you see in the photos. It feels sooooooooo good! I'm not a materialistic person at all. 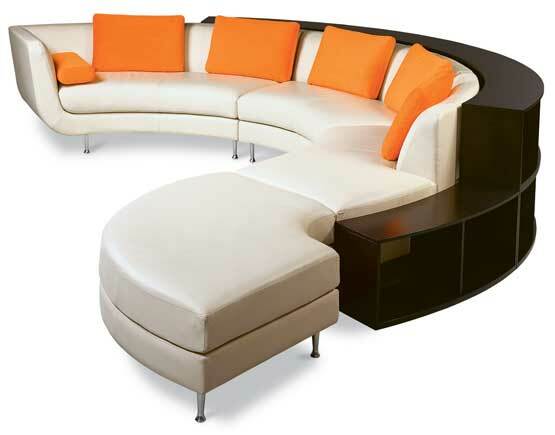 But this sectional has caught the eye of both my sister and me. My sister has the space for it. I don't. But is leather too 90s? Would you invest in new furniture for an old place you're living in (and don't know how long you'll stay in it)... or wait until you're in a new place and get rid of the old furniture? 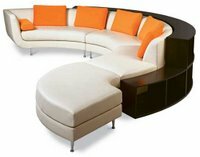 I might be adding this sectional to my shopping list really soon, especially if I were to take on a job like this -- a ghost writing gig -- but... nah, I'd really want all the credit for my writing. What do you think? Take a look. And have a nice Saturday! Other cool furniture sites I've checked out recently: Horizon and Room and Board. First, thanks to you all for your kind words, thoughts, and prayers. My family appreciates them and we are doing well. Thanks for the love! Now, back to work, writing, all that stuff... I missed reading the blogs. I think we need to outlaw the "cc" task in email. Same for "bcc." Especially the "bcc." Both are for tattle-tellers and drama lovers -- adding people to the email in a public or blind way. And people who like drawing more people into a situation than need to be involved. And at this point in my life, I really don't need or want any tattle-tellers or drama lovers except in a good book. 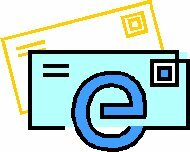 I think email has really diminished our ability to communicate and have real relationships with each other. Instead of stopping down the hall to talk about something in person, or talking to someone about our interest in them, many of us rely on the screen and keyboard to send messages. Especially messages that start out simple, but end up complicated because of the computer. Can we try banning the "cc" or the "bcc" for a while? And only get the people involved who need to be involved. And actually talk to that one person (maybe two) we need to talk to, instead of involving the entire group of people who don't need to be involved. You got "cc" or "bcc" stories from your life or place of employment? Why does it seem that at a time when families come together -- whether it be for a funeral, a wedding, a graduation, even a family reunion -- that the characteristics of people's personalities come out to the extreme? Both the good and the in-development qualities and characteristics? One trait/belief I picked up from my father is calmness, being able to see many sides of a situation before making a decision, not getting upset at what other people do since the only "doer" you can control is yourself -- and maybe your kids when they're minors. I don't know if any of you have read Terry McMillan's novel, A Day Late and a Dollar Short, but I think it's such a realistic portrayal of contemporary black families in the U.S., and I thought of the book a lot -- among other things -- while hosting a number of family and friend visitors. Anyway, still in Michigan and Indiana. Interesting places compared to L.A. Will be going back there at the end of the week. Thank you all for your kind words, thoughts, and prayers for me and my family. I've learned a lot this week. And felt/reflected a lot this week also. Nothing prepares you for the loss of a parent, but hearing from many of you through email or a phone call was comforting. The day after is weird. From the time you learn to the time of the final goodbye, you're surrounded by people 24/7, have what seems like a million decisions to make, and a ton of papers to sign. My dad, fortunately, kept his papers pretty organized, easy to find, and user friendly, so to speak, so our decisions were not too difficult. That helps a lot. But today, now that the goodbyes are done and ceremony over, it's back to us. We slept in past seven for a change. So eerily quiet in the house. I guess that's how it should be. On a similar note, I know it's not the funnest dinnertime conversation, but it might be worth talking with your parents or siblings or significant other about their wishes, their papers, and what they'd expect... or even if they've already paid for, or are considering paying/planning in advance for, their final arrangements. It can make things so much easier for everyone involved. Like I said, not the typical fireplace discussion, but something worth considering before you're there. Thank you all again. 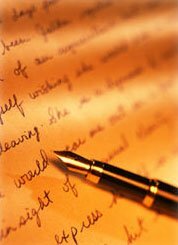 I'll be writing again soon about books, my writing, hot spots, and all the other things I normally get your advice and thoughts on. It's the call you know you're going to get someday, but you're never really prepared for the day it actually happens. That one of your parents has died. My dad. Wednesday morning. So unexpected. There is no handbook or rulebook for what you do, how you plan, how you deal. I'll be away for a while. But I know some of you know me personally and really well, some of you know me only through my novel or the blog. Either way, I thought I would share a bit. My dad was so cool, fun to be around, and so supportive of ALL things I did, as well as supportive of my sister and my mom in ALL things they did. Very proud father, as I wrote about him last fall for his birthday, who knew how much we loved him and who shared unconditional love with us all the time. A father who stays around to rear you, stays loyal to his family, and enjoys you as an adult as much as when you were a kid seems like such a rare gift and blessing these days. I definitely feel blessed to have had him for the years I did. Writers. Go to VONA Voices at University of San Francisco this summer! Just read a summary of the nominees for the 2006 Lamdba Literary Awards, recognizing the achievements of authors writing for and about LGBT issues and community. Read more at Keith Boykin's site on some of the black LGBT nominees, and read more at the Lambda Literary Foundation site. Congrats to Keith Boykin (nominated for Beyond The Down Low) and Samiya Bashir (nominated for Where The Apple Falls), two of the nominees I've had the pleasure of meeting over the course of the past years while out doing book-related work. But I also want to congratulate many of my writers friends -- I call them the Class of 2005 -- who I got to meet over the past year who deserve special recognition for their projects on black LGBT life and characters. Specifically guys like Trent Jackson (At This Moment), Rashid Darden (Lazarus and forthcoming Covenant), Dayne Avery (I Wrote This Song), Brent Dorian Carpenter (Thugg The Barbarian King), and Alphonso Morgan (Sons), who did many of the same Pride Circuit book events as I did in summer 2005. Great guys who are working hard to write and publish their stories... and are a ton of fun to talk and hang with when we can. And I must not forget Fiona Zedde, who brought us her great novel Bliss, and who is a great label mate -- we're published by the same publishing house. Oh, and go to Rashid's site and order Covenant. I've had a chance to read it -- TRUST-- it's excellent. I've always told Rashid he's the valedictorian of our Class of 2005. He knows how to write... and how to put together a story that people will enjoy and re-visit. That Jesuit education pays off, huh, Mr. Georgetown. And also want to congratulate guys who bring us book clubs and conversations like Derrick L. Briggs and Booked L.A., who are about creating community, having fun, and getting people into books. Herndon Davis for getting our true life stories on television through his talk show. I know there are a ton of others out there. Tell us who they are. Anyway, I am still loving that Dolly Parton quote from below: "I didn't win, but I'm sure not a loser." Hope it's a good Tuesday wherever you are! But Sure Not A Loser. Best quote of the night, following the annual Academy Awards last night. On E! "I didn't win, but I'm sure not a loser." -- Dolly Parton, with her big smile and humorous and positive personality, on her not winning an Academy Award for Best Original Song. You know I admire the career of Dolly Parton... don't ask why, it's just my thing. I think she has one of the best attitudes about herself, being a celebrity, and life in general. And so darn funny in interviews! And so darn talented... having written almost 4,000 songs in her life. Just the voice and natural talent. Carnaval. Gay Men's Chorus of Los Angeles. I had the opportunity to meet and see the guys of the Gay Men's Chorus of Los Angeles perform a few weeks ago in Los Angeles at The Roxy. It was a great evening of Broadway-inspired song and performance, with Doris Roberts of Everybody Loves Raymond serving as host. Hilarious and fun evening. And now I'm excited to help them bring their performance to a college audience in a few weeks. Check out the GMCLA website for more information on their upcoming events in the L.A. area... and upcoming tour dates to places near and far. Carnaval is the theme of their new show, which they will be touring in parts of the U.S., and then in South America later in the year. Don'tcha wish your boyfriend was hot like him! Don'tcha? Well, maybe. Maybe not. But it's a nice image for the upcoming campaign of the chorus. I like the blues. 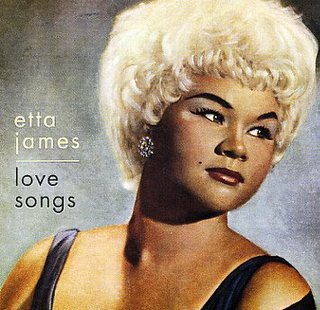 And I like Etta James, also known as the Matriarch of the Blues. You may know her classic songs: Tell Mama, At Last, A Sunday Kind of Love, I Would Rather Go Blind. She's got a new project, All The Way, coming out in a few weeks, in which she covers Prince, R. Kelly, James Brown, and Marvin Gaye. A small departure from her projects of the past five years, primarily blues, but still a great project. And... unlike some of our 60-something artists who go into seclusion, Etta James has recorded a project almost every year for the past 15 years, still tours, has stayed true to her original musical roots, and includes her sons on all her projects as producers and musicians. Let's hear it for Ms. James. 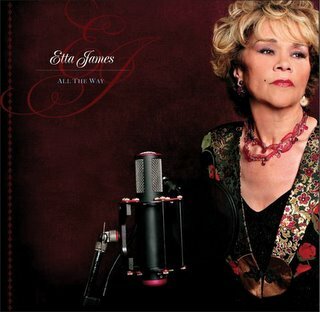 And "tell mama" that Etta James is still around in 2006. Another Question Out Of Nowhere. Let me preface... this is not about me. At all. I'm not even involved with anyone seriously at the moment. 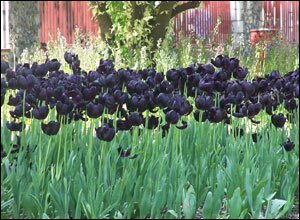 And did you know there was a such thing as black tulips? I didn't. They're kinda cute. I am off subject. Sooooo... with that in mind. Your partner... your romantic partner of a year... tells you that s/he's no longer attracted to you. "I just don't find you hot anymore." "I'm shocked. I had no clue you felt this way." "I'm trying to work through this. It's not about anyone else. But I still want to be your partner." This is after a year of dating. Good qualities in both partners -- the kind mama would love in your partner. Open communication. No money drama, no ex drama, no family drama. Vacations planned and tickets bought for spring and summer trips already. Would you stay? Would you leave? Would you wait until the partner works through his/her attraction issues? How would you feel? Have you ever lost the physical attraction toward a partner, but still had love/feelings that made it worthwhile to stay? Did you work through it? Could you be in a non-physical romantic relationship? Now offer some of your thoughts. Or use this as a basis for a short story or character profile you're creating on your own. It's cool with me.